We've been busy round here. Next Wednesday is my 30th birthday, and we're throwing a Dia De Los Muertos party in the back yard. 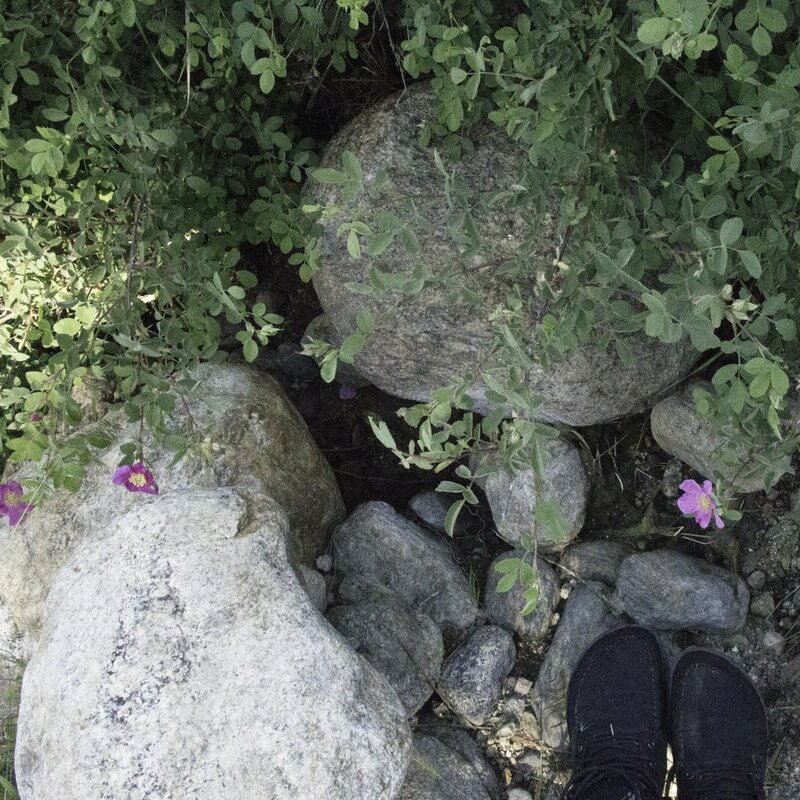 I basically wanted to recreate the graveyard in San Miguel De Allende that we spent my birthday in last year, and I'm one of those annoying people who will try and make everything myself, so we've been building Katrina statues and gravestones and hanging paper cut outs and gathering flowers. No mariachi bands or actual dead people, but the former we can simulate and the latter I don't ACTUALLY want at my birthday party... And it's been cold. Cold enough for central heating and for steaming mugs of coffee and wrapping up in blankets. Cold enough for the light to get crisp and bright. Cold enough for tarts that are piping hot and fresh out the oven after a roast dinner. What are you guys doing for Halloween or Day of the Dead? Dressing up? Parties? Switching all the lights off and hiding? Rhubarb galette with an almond crust. This crust recipe comes from Sarabeth's cook book. I modified it a bit, switched in gluten free flour, changed the quantities a touch, but that's it. Grind the almonds in a blender until like a coarse meal. In a big bowl, dump the flour, ground almonds, sugar and salt. Break the butter (very cold butter) into chunks, and start to mix through with your fingers. Start pinching the butter into the flour, quickly and regularly, until the butter is in pea-sized chunks, and the flour is looking quite grainy. Then, mix together the egg yolk and cream, then pour over the mixture. Using your fingers, quickly bring the mixture together, without working it too much. If it's too dry, add a tiny bit more cream. It should barely hold together. Roll into a ball. Flatten with the palm of your hand until it's a disc, then wrap in cling film and refrigerate for at least 30 mins. Roll out the pastry dough into a big round on a Silpat or similar. Chop the rhubarb into appropriate size- I laid them out over the round and made little marks where I was going to cut each one. Then lay them out. 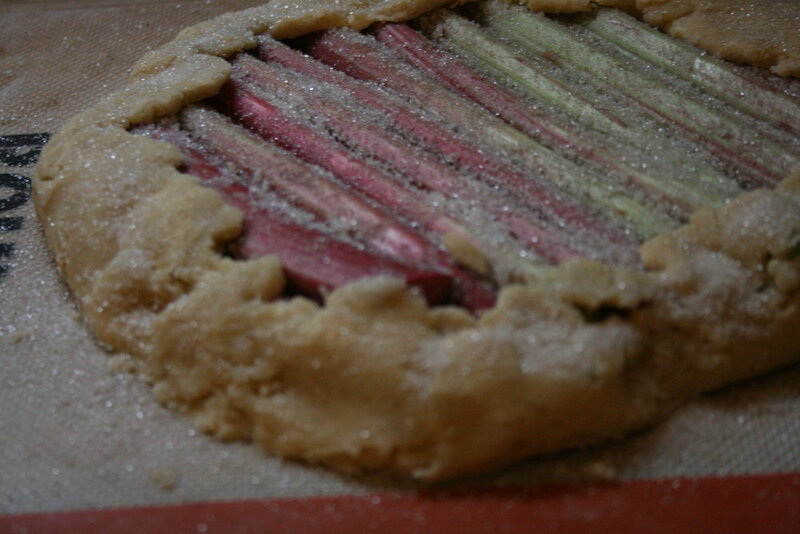 Mix the sugar and vanilla together, sprinkle liberally over the rhubarb, and fold the edges over. If you're not going to bake it immediately, stick it on a solid board of some kind in the freezer- mine often hangs out there for a few hours till I'm ready to cook it, that way I'm not frantically making dessert while dinner's cooking. A chef friend once explained this to me- something about the water in the butter not getting the dough all soggy, and when it cooks it expands quickly, or, er, something. There's a chemical reason for this. I also like that it's out of the way. And it does seem to make the crust deliciously flaky. When ready to bake, preheat the oven to 350. Plop 4 dabs of butter (about 1 tsp each) over the rhubarb, and slide into the oven. Bake for 45 minutes, until the crust is golden brown and the rhubarb is very tender. Cut with a sharp knife- that rhubarb has lots of stringy bits.